When Inger recently mentioned the provision of chocolate frogs at a recent PhD students’ event – how civilised! – I couldn’t help passing comment. Because this isn’t the first time I’ve caught Inger tweeting about delicious food! And we all remember the picture of a table covered in gorgeous iced cakes, on a recent Thesis Whisperer posting. Oh, yum! Well, I should have kept my mouth shut, because Inger has now challenged me to write a piece about the relationship between chocolate and doctorates – apart from the words having five letters in common. Thanks, Inger! I’m tempted to help myself to a chocolate biscuit as I write this, but that would display a shameful lack of self-discipline. We all know, deep down, that not only does excessive chocolate make our clothes too tight, but self-discipline really is vital, whether it comes to avoiding excessive chocolate, or getting the thesis in on time. I managed the latter, so presumably I have hidden resources of self-discipline. If I could only remember where I left it! And what am I to say about chocolate? I could write a WeightWatchers-esque article reminding everyone that, whilst a little of what you fancy does you good, a moment on the lips means a lifetime on the hips. No, that would be too preachy. Instead, maybe I’ll just share a few thoughts about the whole ‘Mens sana in corpore sano’ thing. A healthy mind in a healthy body (or, as Victoria Wood’s book famously said, ‘Mens Sana in Thingummy Doodah’!). And I do know what I’m talking about here, because I’m a migraine sufferer. I can’t stop myself having migraines, but I can take steps to lessen their frequency and severity. And those same steps are actually quite good in combating the stress that everyone undergoes during doctoral studies. So, here goes. In the first instance, I’ve learned that too many sweet, processed sugary foods just lead to blood-sugar highs then lows. Not good – the human body functions much better in a relative equilibrium. I hope this doesn’t read like your mother talking, but I’m in my stride now, so I’ll go on. Humans function better on regular re-fuelling. Believe me, I know how it feels when you’re in the middle of reading something fascinating at the library, and it’s so specialised or rare that you can’t borrow it – or you’re just at a critical point in that chapter you’re writing, and you don’t want to lose momentum. Sometimes you can’t help just forgoing sustenance until you reach a suitable point for a break. But where possible, a quick break and a sensible snack are good for your metabolism, good for your eyes, and essential for your mental well being! Too much caffeine just makes you jumpy. Sorry, but that’s the way it is. I’ve learned to drink more tea and less coffee. I can’t and don’t see the need to give it up, just to exercise a bit of restraint. And it follows that a Mars bar or an iced Danish pastry and a cup of coffee isn’t really the best lunch, no matter how quick, cheap and tasty. Alcohol is ‘a good servant but a bad master’. Enough said. (In my case, I know I’ll get a migraine long before anyone else would worry about a hangover!) Don’t let it affect your productivity! I seem to have strayed a long way from my brief to write about chocolate and doctorates. Or have I? Of course you can have the odd sweet or starchy treat – just so long as it’s occasional, and not a staple part of your diet. Now, that delicious sandwich that Inger posted the other day … spot on! I can’t remember now, but – was it wholemeal? Surely it must have been! 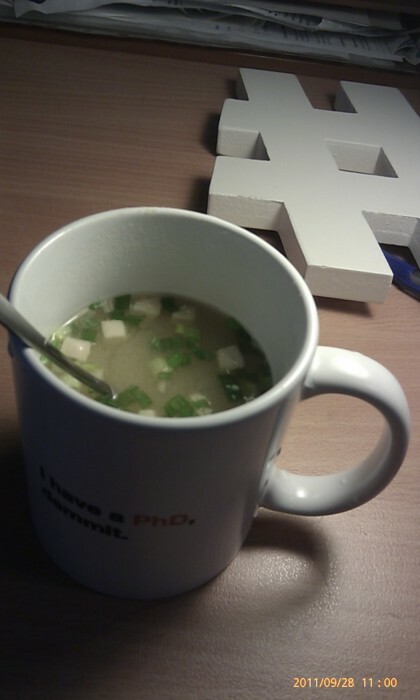 Have you developed an unhealthy relationship with food during your PhD? Or have you managed to keep everything under control? What tactics have you used to stay healthy while studying? Is losing weight similar to writing a thesis? « Treat your supervisor right! Healthy!?! Surely you jest? I’ve just marked 45 papers fuelled by half a kilo of Jelly Bellies! But it’s not chocolate so that must be ok? Now I’m probably going to be pelted with rotten tomatoes for saying this but I couldn’t agree more with the exercise comment. I do 3x1hr sessions at the gym and walk most days at lunch for about 20 mins and I swear it is the only thing keeping me sane. I am doing a phd while working full time (in an unrelated field), so my time is limited as it is, but those few hours a week have had endless benefits. I sleep better, I’m more relaxed, I don’t get sore from sitting at a desk for too long and I can concentrate for much longer. However, I recently recieved a 1.13kg.box if chocolates (literally the size of my coffee table) from friends as a “phd sanity present”. So really I think chocolate and exercise go hand in hand as phd survival tools. I run with a fellow PhD student (and her dog) each week and it’s a great stress reducer for both of us (and the dog presumably). We run slow enough so we can talk the entire way and 90% of the time we talk thesis. I think good food and good exercise were the two things that got me through my thesis. Me and my mum shared an office while we were finishing our PhDs and used to share raspberry and white chocolate muffins and go to yoga together. I also took up the couch to 5k challenge during a really hard time with my thesis, i felt I was at least making physical progress at something if not progress with my thesis. It was probably just as well cos I was also de-stressing by baking biscuits every second afternoon. When I sit down to write anything other than a trashy email my stomach starts to grumble.